National Chairman of APGA, Chief Victory Oye, has denied that the party is supporting President Buhari in 2019. The All Progressives Grand Alliance on Wednesday said it was not supporting the 2019 reelection bid of President Muhammadu Buhari, Punch has reported. The report revealed that the National Chairman of APGA, Chief Victory Oye, stated this at a press conference in Amawbia near Awka, the state capital. Oye’s reaction came following the relationship between the state governor, Willie Obiano and Aso Rock, resulting in the governor accompanying Buhari to several trips abroad. Some had insinuated that Obiano’s seeming support for Buhari was a payback gesture to the president for allowing a free and fair governorship election in the state in 2017 where Obiano won the poll against the candidate of the All Progressive Congress, Dr Tony Nwoye, who came a distant second. 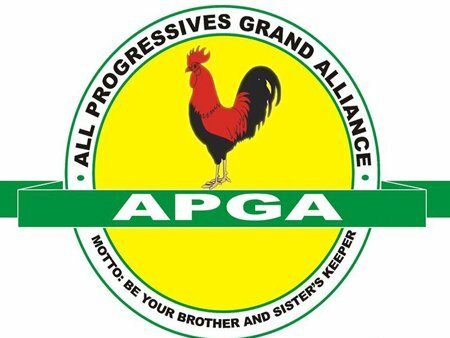 At the press conference on Wednesday, Oye said APGA had one of the best presidential candidates in the 2019 race. “They say APGA is working for the APC; that’s balderdash. We’re not working for the APC; we’re working for ourselves. ”APGA has chosen a presidential candidate in the election, General John Gbor, and his running mate, Jerry Chukwueke, an international businessman. “Our presidential candidate is a Ph.D. holder in Anthropology. We’re working to market him and he is highly accepted in the whole North Central. He is a man without any blemish as far as Nigerian politics is concerned. ” He was a director of the army elite corp. That’s not a small feat in the military. Speaking on the crises that trailed APGA primaries, especially in Imo and Anambra States, Oye said the party had expected that because of the successes the party had recorded in Anambra in the past 12 years. He said that the party was on top of the situation, adding that various reconciliation committees set up to handle the internal wrangling were working assiduously to resolve the issues arising from the party’s primaries.